1. After the user registers with the system he is redirected to the home page.The session information is also maintained for the user. 2. Click on wall To view your wall Posts. 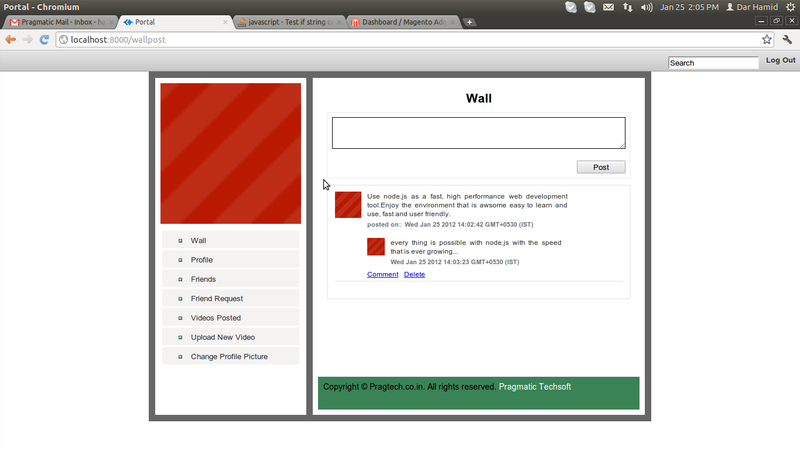 You can post on your wall, comment on the wall and delete the wall post. 3. Click on the friends tab to view your friends. 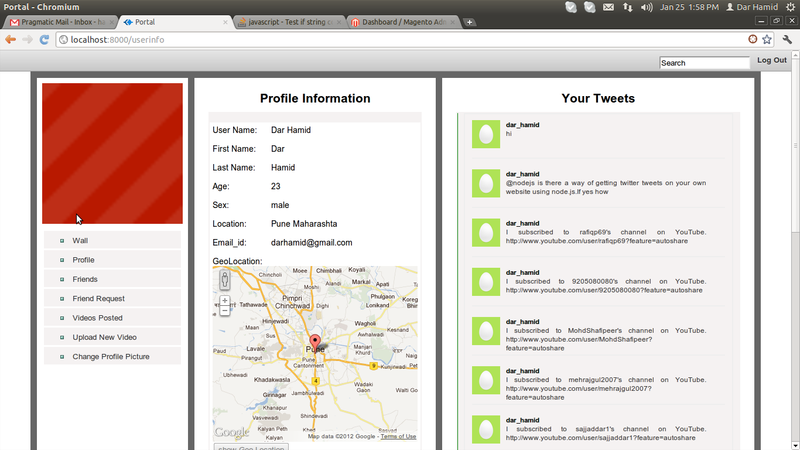 Click on any friend to view the full profile of your friend along with the his/her geolocation. 4. To see the list of videos posted by user click on the linked tilted videos posted. Play the videos and have fun. You can also upload your video. This feature truly illustrates how fast a node.js application can be. Browse the video, click on upload button and the video is uploaded for you. You can also change your profile picture. You can also use the application in your mobile browser. The application recognizes your mobile browser and provides you the appropriate mobile view of the application. This application is an effort from pragmatic Techsoft still in the development stage and still many features to add to provide fast, reliable, and highly scalable web application development environment using node.js, express and mongodb. Pragmatic is a global open source enterprise software development, consulting and training company. We have expertises in Enterprise Resource Planning (ERP), Customer Relationship Management (CRM), Human Resource Management (HRM), Business Intelligence, Data and System Integration and Web Design and Development. We have served Education, Manufacturing, E-commerce, Retail, Distribution among other industries. We have experience in open source technologies such as Ruby, Ruby on Rails, Python, OpenERP, JasperSoft Business Intelligence, Talend ETL and Data Integration and Rhodes Mobile Development. 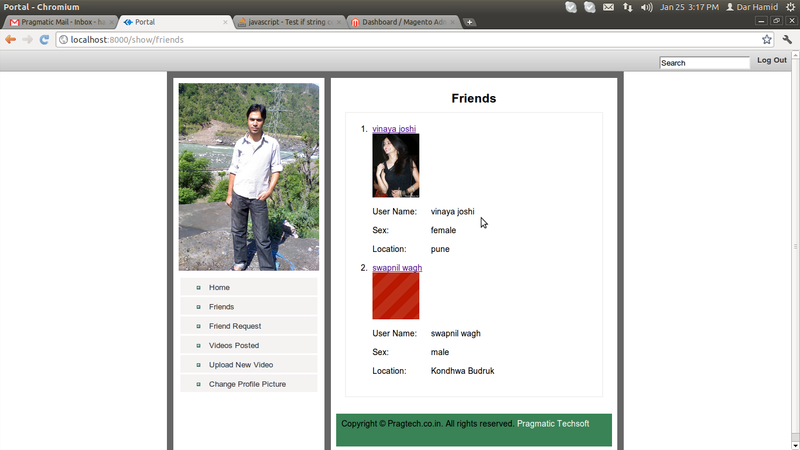 © Copyright 2011 Pragmatic Techsoft Pvt Ltd All rights reserved.. Powered by Blogger.